The Exxon stock price moved slightly higher today (Thursday) after Exxon Mobil Corp. (NYSE: XOM) decided to delay repairs of its Torrance, Calif., refinery. In February, Exxon's Torrance plant suffered a huge explosion caused by over-pressurization of gasoline-making equipment. The jolt from the blast injured four workers and was equal to a 1.7-magnitude earthquake, according to the U.S. Geological Survey. 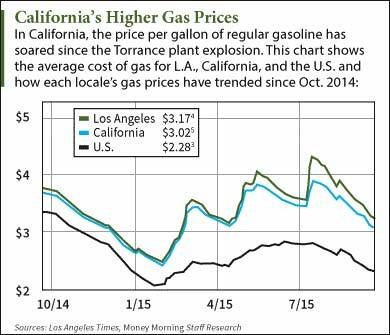 The Torrance refinery provides one-fifth of southern California's gasoline supply. Since the explosion, it has operated at less than 20% capacity. That diminished capacity has made the state's gas prices 32% more expensive than the nationwide average. Today, Exxon Mobil announced it is abandoning short-term repairs and pursuing a long-term approach that will restore the plant to full capacity next February. The decision has sparked criticism among California motorists who have been awaiting relief from high gas prices since the incident. The Exxon stock price responded this morning by gaining 0.1%. As of 12:10 p.m., shares of XOM stock trade at $72.38. Despite today's boost, the stock has cratered 21.2% since the Feb. 18 explosion. As one of the largest gasoline plants on the west coast, the Torrance refinery's continued shutdown could cost Exxon millions in potential revenue. Combine that with the record-low oil price environment, and the Exxon stock price could keep falling throughout the rest of 2015. But if you're solely looking for a strong dividend stock, Exxon boasts one of the highest yields in the oil sector at 4.04%. Exxon is one of the few energy firms on the "dividend aristocrat" list. The dividend aristocrats are S&P 500 stocks that have increased their dividend payouts for 25 consecutive years. That makes Exxon's dividend policy one of the most competitive in the energy market. In the second quarter, the XOM dividend increased 5.8% from Q2 2014 to $0.73 a share. That's more than every other Big Oil firm, including BP Plc. (NYSE ADR: BP) and Chevron Corp. (NYSE: CVX). Stay tuned for more oil stock updates. Follow us on Twitter at @AlexMcGuire92 and @moneymorning for breaking news updates in the energy industry. Terrible article. Its fact is that the stock has cratered but to try and infer that it's because of the explosion is ridiculous. It's one of the tiniest refineries in this behemoths portfolio. In general the entire industry is at bottom. But if you want to paint a picture like somehow the refinery issue is affecting stock price (.1% gain, really?) I guess nobody can stop you. But credibility will suffer. Just FYI.